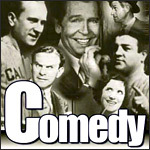 Amos 'n' Andy was arguably the most popular program in the history of broadcasting. Each night, a third of the nation's populace tuned in to hear the comic misadventures of the proprietors of the Fresh Air Taxi Company. Amos Jones and Andrew H. Brown were constantly either devising or being suckered in to schemes in the pursuit of love and money, the basic needs that struck a chord with Americans suffering through the Great Depression. During the show's three decade run, the foolish twosome was joined by a truly memorable cast of characters, including Kingfish and Sapphire, Ruby Taylor, and the Widow Parker.